The term “keys” is such an integrated part of our life, we don’t even think about it. We grab our keys on our way out the door, we have a key ring for our car keys and home keys—even some necklaces and notebooks come with keys. There could practically be a key for everything, which begs the question—where did keys come from, anyway? It’s interesting to think about, because even though keys are so commonplace today, there was a time when they simply didn’t exist. When did people start feeling a need to keep things (and themselves) protected? How did the idea for keys come to fruition? Our locksmiths will answer all these questions and more. As Nashville’s locksmith of choice for over 16 years, we’ve worked with all types of keys, in all types of situations. With automotive, residential, and even emergency locksmith services, we’ve practically covered all of the bases in the greater Nashville area. 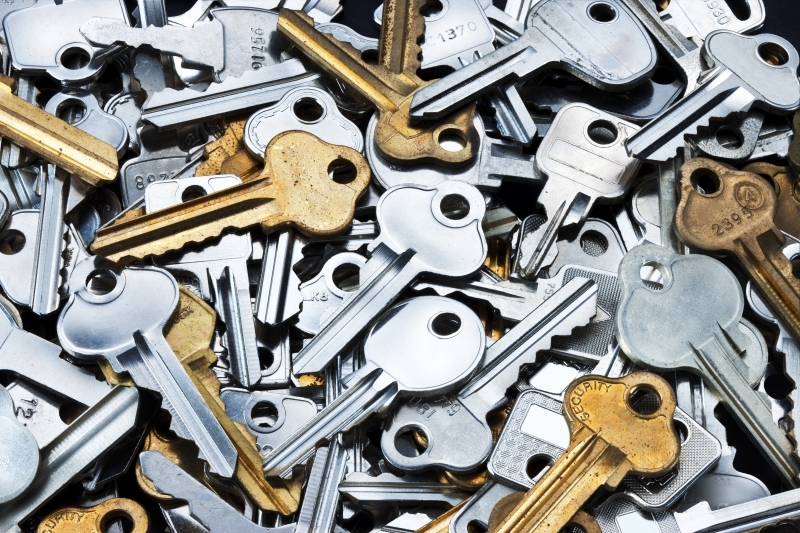 Learn about the history of keys, and contact our locksmiths to get the help you need! We would be honored to work with you. In order to have a key and a lock, you need something that you want protected. The purpose of a key and a corresponding lock is of course to keep something safe, whether that’s from being taken or simply messed with (which anyone with siblings growing up can relate to). Some of the earliest forms of keys were not actually keys, but complicated knots. These were knots that were extremely complex—to undo or break them required knowledge that would be similar in comparison to picking locks by today’s standards. This is not something that’s super common. As an article from the New York Times reported, “Knots are an ancient technology. They predate the axe and the wheel, quite possible the use of fire and maybe even man himself.” The article explains that some scientists think the first knots may have been constructed by gorillas, in order to create nests. There is something so innate and instinctive about knot tying, that perhaps our pre-human predecessors even developed and practiced using this tool. Granted, not all knots were used for protective purposes, but that particular usage developed over time. Eventually, our skills and uses for woodworking developed, and the first simple key was constructed. Six thousand years ago, the earliest keys showed themselves in Egypt and ancient Babylon, and had small pins hidden internally. A wooden key was made as a match, lifting the small pins upon insertion. However, a wooden key could be warped and chipped with not a whole lot of force, meaning this original form had lots of room for improvement. The oldest known lock to be found was discovered in a palace near Nineveh, which was an ancient Assyrian city (now known as modern-day Iraq). It was estimated to be 4,000 years old! The Romans were known for many technological developments, and their metalworking was one of them. They were able to advance the existing wooden key and lock prototype and create a metal version, which was more durable and efficient as a whole. However, this latest technology did not come without problems. Metal keys were more of a luxury, and showed that you not only had possessions to protect, but you could afford keys yourself! It didn’t exactly help the affluent Romans who used keys that they wore them on their fingers as rings. This showcasing of wealth was virtually equivalent to walking around with your wallet and a few twenties in plain sight—needless to say, this symbol of wealth made it very easy to tell who was wealthy (and easy for pickpockets to pick up on). Locks and keys stayed relatively the same in terms of their construction and overall look for many years. Eventually, however, locksmiths had a new challenge upon them in the form of building safes. As developments continued in the metalworking world, so did the overall expansion of types of belongings. Additionally, the 16th and 17th centuries saw massive advancements in trade capabilities—suddenly items such as pearls or gems could be brought practically to your doorstep. With an increase in belongings as a whole, the wealthy found an added discomfort in the thought of losing their goods. This not only meant locking their homes as a whole, but creating safes as an additional security measure. During this time period, if you were wealthy enough to own locks and safes and to work with a personal locksmith, you were one of the few. This was still overwhelmingly considered a luxury, granted to the vast minority. With metal locks, you were clearly wealthy, because you clearly had something of value—and break-ins were a fear that hadn’t previously existed, or at least not to the full extent. This fear created much of the distrust that we still experience today when it comes to leaving things unlocked. This was a huge development, because practically all the inventions that happened during this time period influenced how we use keys today. While more modern and keyless options are becoming more popular, if you’ve ever unlocked your car, bike, house, apartment, safe, mailbox, or bank vault with a key, you used a design that has essentially remained unchanged for the past 200 years. While many things in the world of keys and locks have remained the same, there have still been some substantial changes. One such example is with locksmiths—in the past, locksmiths were renowned creators of keys, as well as locks and safes. Today, locksmiths more so work in the world of repair and replacement—still equally revered and important to society! But as modern advancements in technology have affected keys, the production of them is mostly contained to industrial manufacturing. In the future, we might be seeing more wireless, keyless, and bluetooth technologies taking place. Some car designs are featuring keyless entry, and many businesses now rely on key FOBs for employees to access the establishment. For some, keyless entry brings a sense of insecurity. Historically, we’ve been using the same types of keys for over 200 years, meaning that it might take awhile for this change to completely take over. If there’s anything to be learned from the history of keys, it’s that adaptations and evolutions take time. No matter what your key situation entails, the locksmiths at ABC Lock & Key are the Nashville experts you can trust. We know a little about the history of keys, but more importantly, we have established a history of being Nashville’s best locksmith for over 16 years. Call us today to get residential locksmith, emergency locksmith, and automotive locksmith services!